When David A. Kelly’s two sons were in elementary school, their literary taste was fairly mainstream: They liked sports novels and mysteries. To Kelly, a writer who lives in Newton, it was obvious that something was missing on bookstore shelves: a series combining the two genres. Using children’s literature to explore one of his family’s favorite subjects — big-league baseball — seemed irresistible. Kelly began drawing up ideas for mysteries that take place at ballparks, and the first two in the series were released earlier this year. Three more are in production with the Random House publishers. 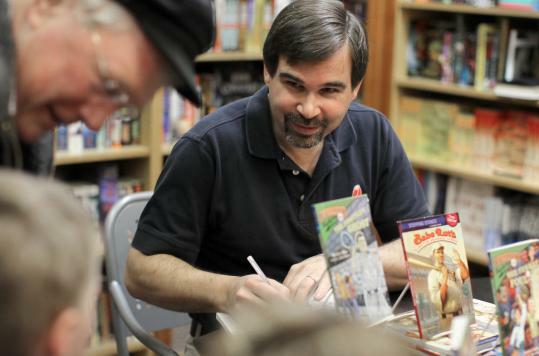 “The characters are there simply to watch the game, but then they find out the star slugger’s bat has been stolen and they decide to untangle that mystery,’’ said Kelly, who signed books last weekend at Newtonville Books as excitement built toward tomorrow’s home opener for the Boston Red Sox. Though not a diehard baseball fan while growing up in upstate New York, Kelly was drawn in to the world when his wife, Alice, and two sons, Steven and Scott, took an interest in the Red Sox. Watching or attending games became a family event, and Kelly’s passion for baseball was stoked when his sons started playing Little League, as he had — albeit somewhat halfheartedly — when he was a boy. Mystery writing for children was an entirely new genre for Kelly, who has worked as a freelance writer for The Boston Globe, The New York Times, and several technology publications. His early drafts took too long to hook the reader. In Kelly’s second book, “The Pinstripe Ghost,’’ Kate and Mike travel to New York for a weekend series in Yankee Stadium. “While there, they hear about a ghost, and they set out to find out if the ghost is real,’’ Kelly said. The third, fourth, and fifth books feature the Dodgers, Astros, and the all-star game, respectively. Research for Kelly involves traveling to baseball stadiums and figuring out what angle to take. Kelly conceded it is not exactly a grueling process. Of course, it’s also work. Things that make a ballpark unique can also inspire twists and turns in a mystery. But Kelly said it is not just for the fun of visiting ballparks that he has chosen to stick with this genre. Not that there aren’t diehard baseball fans — and readers — among girls. Much of Kelly’s fan mail comes from children who want the author to write about their hometown team. A recent week brought an e-mail from an 8-year-old in Wisconsin who wants a story featuring the Milwaukee Brewers, and another from a 9-year-old in Colorado who hopes Kelly will write about the Colorado Rockies. With the baseball season starting, Kelly is finding an eager audience closer to home as well. His next speaking engagement is at the Newton Free Library on May 24 at 3 p.m., and he will throw out the first pitch at the Portland Sea Dogs game Saturday in Maine. Although he still does some business and technology writing, Kelly said, he is happy to be under contract to Random House to continue his baseball mystery series. Kelly said he hopes eventually to move on to other genres and age groups, but for now he’ll stay with baseball.